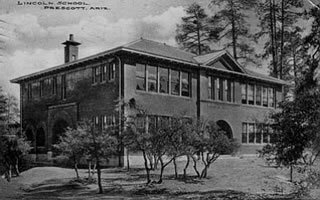 Early in 1908, the Prescott School Board made the decision to erect another school building in west Prescott. On March 10, 1908, the taxpayers of School District #1 authorized the Board to hold a special election for a bond issue, and on July 12, the election went in favor of the sale of bonds — 119 to 1. In August, 1908, the Park Avenue site was selected. The contract to build in the amount of $19,480 was given to Clinton Campbell, and the project for the erection of the north building was completed by late 1909. Lincoln School had opened its doors for the first time. The school’s first principal was Glen Persons, who was shared by both Lincoln School and Washington School. The first full-time principal was Miss Piper. Other principals who served Lincoln School in its early years were Verle Beaver, Mrs. Keeney, Mrs. James (not related to Floyd James), and Mata Dexter. Abby Taylor then served as principal for several years. In 1930, Lincoln’s building was bursting at the seams and its second structure was built. During these middle years, Irene Heller and Jim Burhans both served as principals. In 1970, Principal Charlie Phillips began his term and remained at Lincoln for a total of 12 years. Floyd James followed him in 1983 and retired in 2003. Mr. Frank Lawhead assumed the helm in the fall of 2003, followed by Mr. Bucky Bates in the fall of 2007, Mrs. Teresa Bruso, and currently Mrs. Karen Hughes. As the Lincoln School attendance area grew in numbers of students, the need to update the facility arose once again. Thanks to the effort of community members who supported an $11 million bond issue in the 1989 election, Lincoln School benefited by the addition of the east building, which includes a large multi-purpose room, complete with kitchen and stage, a p.e. office and equipment room, and two rooms designated to house the art and music classes. The cost of this new building, plus minor renovations to the north building, ran close to $597,000. The east building was officially dedicated on December 5, 1990. Honored guests included school board members and Pauline Tovrea, who was a student at Lincoln School in the 1920’s. In the spring of 1999, Lincoln School held its 90th-year Celebration. Many guests, former staff members, and alumni were honored at a special assembly and enjoyed a flag ceremony, May pole dance (a past Lincoln tradition), and visits to classrooms throughout the day to share their memories with the students. Mrs. Sylvia Neely, retired teacher and historian, was very instrumental in planning for and presenting the celebration. In the spring of the year 2000, a time capsule celebration was held. Classroom time capsules were prepared to be opened the following spring, and grade-level capsules were prepared for opening in 2009, Lincoln School’s Centennial Celebration! Lincoln School celebrated its Centennial September 25, 2009.